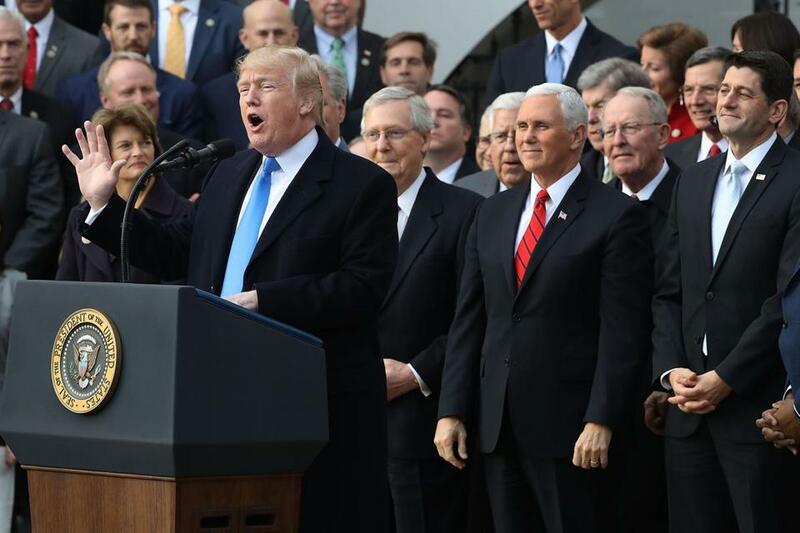 President Trump hosted an event to celebrate Congress passing the Tax Cuts and Jobs Act with Republican members of the House and Senate on the South Lawn of the White House. Workers toiling in the “gig” economy could be getting a tax break. A provision in the federal tax overhaul that President Trump signed into law Friday will sharply lower taxes for many small-business owners, from the pizza shop on the corner to the small manufacturer in the industrial park. But the $1.5 trillion package could also reduce taxes for some in the growing army of freelancers and contract workers who are being used by corporate America to thin the ranks of full-time workers. Software coders, house painters, Uber drivers, even the grocery-delivery guy — all could potentially benefit. That’s because the new law changes the way “pass-through” companies — which pass profits directly to their owners as personal income — are treated in the tax code. Now many will be able to cut 20 percent off their taxable earnings. Someone earning $50,000, for example, could only have to pay taxes on $40,000. It’s one of many provisions in the 500-plus-page law that takes effect in January. The legislation also lowers individual tax rates, and changes or eliminates popular deductions over the next eight years, while permanently cutting the corporate tax rate from 35 percent to 21 percent. The new pass-through provision is designed chiefly to aid capital-intensive companies, like a factory or a bakery, while excluding certain service industries such as accounting and medicine. But for some kinds of solo workers it could mean savings of hundreds or thousands of dollars, if they incorporate as a pass-through business. Details of exactly who might be able to claim these lower rates are still a bit unclear, even to specialists, and probably will be hashed out over the coming months as tax advisers and their clients test the limits of what qualifies as business income. Already, more than one in three American workers — 57 million people — freelance either full- or part-time, according to a survey by Upwork and the Freelancers Union. Growing numbers of them are incorporated — often as a limited liability corporation, or LLC — for legal, branding, and financial reasons. LLCs come in many shapes and sizes, but creating one is relatively easy even for a solo entrepreneur, said Gary Romano, a small-business management consultant in Lynnfield. Now it could bring a meaningful tax advantage over more traditional self-employment, too. That’s just what Sarah Hawkins plans to do. A self-employed consultant in Roslindale, Hawkins was meeting with her tax planner this week to talk about incorporating to simplify her taxes, which she files jointly with her husband. It could substantially lower her tax bill, she said. Critics of the plan argue that most of the gains will flow to wealthy business owners, like real estate investors. Republican lawmakers, seeking to address that concern, set the 20 percent deduction to phase out for high earners: $157,500 for a single filer, $315,000 for couples. It also excludes a laundry list of service-oriented industries with little capital investment. And it aims to prevent an existing partnership from lowering its tax bill by breaking up and re-forming as a collection of LLCs. Kansas eliminated state taxes on pass-through income in 2012, and the outcome was not what backers had expected. In the three years after the law took effect in Kansas, the number of residents claiming pass-through income jumped 20 percent. As a result, the state lost $200 million to $300 million in tax revenue a year, according to estimates by The Tax Foundation, with most of the gains going to wealthy business owners, some of whom simply restructured existing companies to take advantage of the lower rates. Facing a budget crisis, Kansas lawmakers repealed the tax cut earlier this year. Kansas is a cautionary tale, said John Buhl, a Tax Foundation spokesman, but the federal plan was designed to curb some of the problems that plagued Kansas. Buhl said he suspects that business owners will look for creative ways to qualify their companies for the pass-through breaks. But he also believes people who drive for Uber or photograph weddings could take advantage of the changes, even if it requires doing more calculations at tax time. “They probably will need to get the more expensive version of TurboTax,” Buhl said. Tim Logan can be reached at Tim.Logan@globe.com.